The recent creation of Facebook Open Graph opened a whole new can of worms regarding privacy on social networks. Now more than ever, the world is all a-buzz about privacy. But what about privacy for criminal suspects? 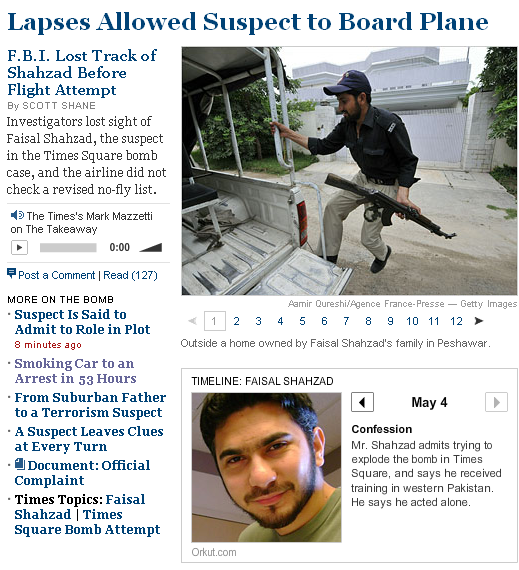 Faisal Shahzad, the suspect who admitted to attempting to explode a bomb in Times Square on May 1st, has been pictured across multiple news sites. Most of the pictures being used to depict the suspect are from Orkut and Facebook, social networking sites that Mr. Shahzad maintained profiles on. From a quick search on both sites, I couldn’t seem to find his profiles. But somehow, news agencies have managed to locate his photos and post them alongside the latest headlines. How could an individual with a plan to unleash bombs in Times Square leave his online social presence completely unprotected from the media? Was he oblivious to the fact that his photos might some day be shared on national television and across the web without his authorization after his attempts at mass destruction? Or did he actually unknowingly give authorization to both sites to share his content with the world? Were the privacy settings too difficult to understand? Maybe it was just that the default settings said, “Yes! Please obliterate my right to privacy,” and Mr. Shahzad didn’t realize it. Whatever the reason, I am amused to see “Orkut.com” as the source of these photos. What are your thoughts on news sites sourcing Orkut and Facebook for photos? Do you think there are any privacy implications?